The participation of the African Union in the next BRICS summit in Durban will foster the economic integration of Africa with the rising powers. The confluence of BRICS and Africa, spanning across three continents, at Durban will be watched with great interest throughout the world. The developments prior to the fifth annual summit in March in Durban indicate that the summit outcomes will have wider ramifications for the region as well as the globe. The theme of the summit this year is ‘BRICS and Africa – Partnerships for Integration and Industrialisation.’ The tone of this broader agenda was set by Indian Prime Minister, Manmohan Singh during the New Delhi summit last year. Singh had identified ten priority areas on which BRICS could focus: job creation, skills upgrading, energy, food and water security, sustainable growth through expanded trade opportunities, clean energy, income inequality, urbanisation, and the impact of the external geo-political environment. 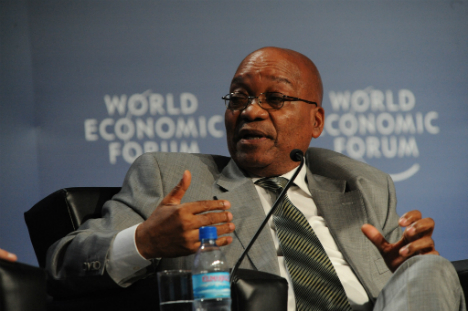 During the New Delhi summit, South African President, Jacob Zuma had extensively held talks with captains of industry and urged them “to join hands with South Africa in the development of the African continent.” At the summit, the leaders of the grouping had declared that they “attach the highest importance to economic growth that supports development and stability in Africa, as many of these countries have not yet realised their full economic potential.” The 2011 Sanya summit, in which South Africa was inducted as a new member, too had emphasised on this eclectic approach of the grouping towards enlarging networks of relations to developing countries of Africa. Another strong reason behind the grouping’s growing interest in Africa is its growth story. Despite global economic slowdown and negative growth in some countries, Africa registered a steady growth in the past few years. Chabane emphasized: “Africa is the fastest growing power after Asia and offers the highest returns on investments of any region.” He further detailed, “The African continent constitutes 60 percent of the world’s unused arable agricultural land. In 2010, six of the world’s fastest growing economies emanated from Africa, and Africa’s output is expected to expand by 50 percent over the next four years. Economic growth is expected to expand by an average of 5.5 percent annually in the next five years.” The mutual trade between Africa and BRICS has increased significantly in recent years. According to an estimate of the Standard Bank, from the time period of 2010 to 2015, the mutual trade will increase threefold from $150 billion to $530 billion. The scramble for Africa, and its resources, is going to accelerate in coming years. Africa is rich in energy resources and minerals, and at the same time some of the regions in it have witnessed internecine rivalries and rise of extremism. The participation of AU at the behest of South Africa may provide the BRICS countries much sought opportunity for a collective engagement for economic development, stability and good governance. The AU has already mandated the South African President to initiate infrastructure development projects in Africa. The Durban summit will be attended, besides AU, many other African organizations like African Heads of State and Government from the eight Regional Economic Communities and the NEPAD Presidential Infrastructure Champion Initiative (NEPAD stands for New Partnership for Africa’s Development). The Chairperson of the AU Commission, Nkosazana Dlamini Zuma will likely meet BRICS members to deliberate on issues like infrastructure funding. The multidimensional engagement between BRIC countries and Africa will not only foster development in the region, but also have a moderating impact upon radical and disruptive forces. Active engagement of the grouping in the continent may also help promote good governance, technological partnerships, common instruments to fight terrorism and maritime piracy, and at a higher level, for global peace and security. The BRICS countries too possess enormous potential to carry out the extensive task of contributing to Africa’s development for mutual benefit. Despite many predictions to the negative, these countries have registered positive growth. The global slowdown might have slowed their economic growth, but not led to economic crises in these countries. The grouping represents more than 40 percent of the world population. Its gross domestic product is estimated at $13.7 trillion and combined foreign reserves at $4.4 trillion. In 2012 the grouping accounted for about 11 per cent of global foreign direct investment flows at $465 billion. The Durban Summit will prove a clincher for BRICS as well as for Africa. It is the opportunity that both the parties must seize. While Africa complements the hunger of grouping in terms of market and energy resources, the grouping can invest in developing infrastructure and basic industries, training the Africans in various sectors. As Zuma had pointed out in New Delhi that year, over the next ten years infrastructure sector alone would need $480 billion worth of investments. Another crucial development at Durban will be the establishment of a BRICS bank to fund developmental activities in Africa and other developing regions. The African Development Bank’s Director for the Southern African Development Community (SADC) region, Ebrima Faal struck a right chord, when he pointed out, BRICS can complement the efforts of the AfDB in investing in infrastructure projects. He sounded optimistic when he said, “We look forward to dialogue on what is envisaged and how the BRICS can contribute (to development projects).” The four areas which will likely receive key focus at Durban, as outlined by Chabane, are: infrastructure development, the establishment of a BRICS-led development bank, a BRICS think-tank and a BRICS business council. In the fast changing global order, Durban provides a crucial opportunity for the rising powers not only to embrace Africa in a framework of friendship and mutual benefit but also to reshape international politics. The rising powers need to realise this emerging imperative, and gear their policy mechanisms to make Durban a success story.